The Rainbow LIFE Institute’s Grief & Loss Services department recently celebrated the graduation of another Bereavement Fellow. 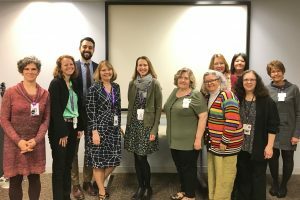 Lydia Backer (fifth from left), MSW, LSW presented her capstone project, a case study entitled, “When the student is ready, the teacher will appear” a quote from Lao Tze, a Chinese philosopher and writer. Lydia’s case study outlined the challenges faced and the resources used to provide counseling to a bereaved client. Lydia was a MSW intern with Rainbow during her first-year internship in 2011 and in 2013 she graduated from UIC’s Jane Addams College of Social Work. In 2018, Lydia returned to Rainbow as a Bereavement Fellow. She completed her year-long fellowship through Rainbow Grief & Loss Services with over 900 hours of counseling. Nancy Paul (first on the left), LPC, LMT is the incoming Rainbow Grief & Loss Services’ bereavement fellow for the next 12 months. She is a licensed professional counselor and a licensed massage therapist. Nancy holds a master’s degree in Pastoral Counseling from Loyola’s Institute of Pastoral Studies. The Rainbow LIFE Institute supports grief counselors-in-training in a variety of ways: through the professional volunteers, graduate program internships, community education, and the bereavement fellowship. Through the fellowship, Rainbow offers education, supervision and direct client experience to master’s trained individuals earning their licensure in counseling and/or social work. To learn more about these programs, please contact Lisa Miller at 847-653-3250 or follow this link.